DESPITE the early morning rain, thousands of faithful turned out for the first session of the 72nd Clonard Solemn Novena yesterday (Wednesday) morning. 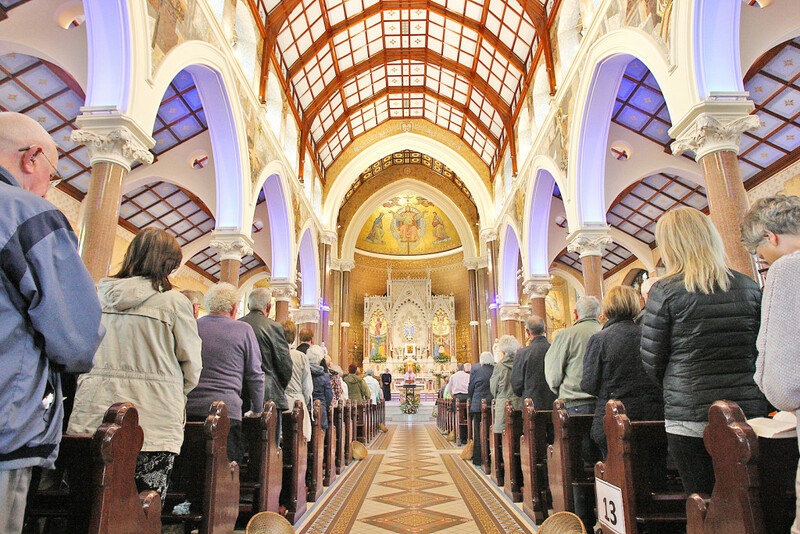 In what is the biggest event in the West Belfast calendar, people of all ages from right across the city and far beyond made their way to the iconic West Belfast church as prayers began in packed-out pews at the 6.45am Mass. The Novena will continue until June 25. During the 9.30am Mass parishioners were greeted by visiting Redemptorist priest and Caribbean native Fr Peter Hill, who shook hands with the parishioners and their families, and Rector of St Joseph’s in Dundalk, Fr Michael Cusack. Prayers were offered for the families of the five young Irish students and one young Irish-American who lost their lives in the Berkeley tragedy, as well as the reading of the petitions and thanksgiving. We took a walk around to speak to the faithful. Philomena McCormack said she was attending the Novena to pray for her little grandson Laurence O’Neill. During the nine-day Novena Fr Kehoe has asked people to follow the directions of the carpark attendants and to park carefully in the surrounding streets.